*The Long and Happy Life buff is a bit more common. 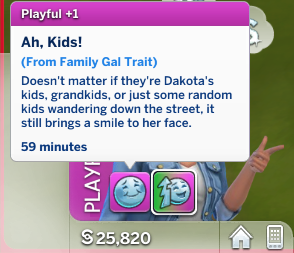 *Replaced the "Have a Child" objective with a "Have 2 Kids" objective. *Fixed an error in the "Long and Happy Life" buff. *Objectives related to age no-longer give points. *Upped the points given for having kids from 300 to 600. *Upped the points given for having a Grandchild from 200 to 300. *Note to translators: I DO need new translations done. *The reward trait now has slower motive decay for Fun. *Fixed a bug with aging objectives. 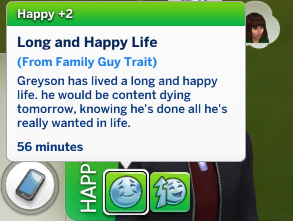 The Family aspiration from The Sims 2 is back! 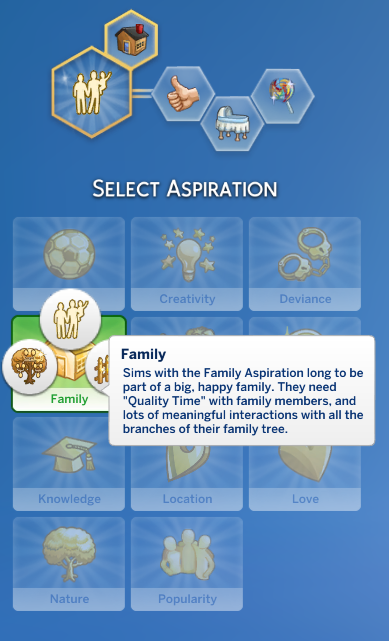 Thanks to Zerbu's awesome Mod Constructor I have recreated the Family aspiration. The original aspiration had 6 levels and each were different depending on age. So I took the 1st from Teen, 2 from Adult, and 1 from Elder. When creating each level I pulled from the name and the original aspiration's wants. In the end, the aspiration sorta became a mix of the Soulmate Aspiration and either of the BG Family aspirations. 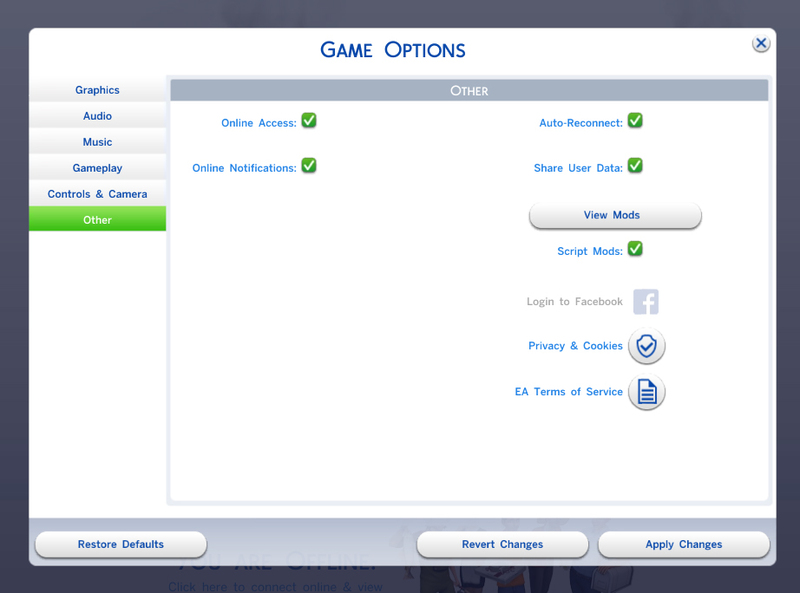 The aspiration will give your Sims whims; though none of them are new whims. Basic things, like Read to a Child, Help a Child or Teen with Homework, Try for Baby, etc. 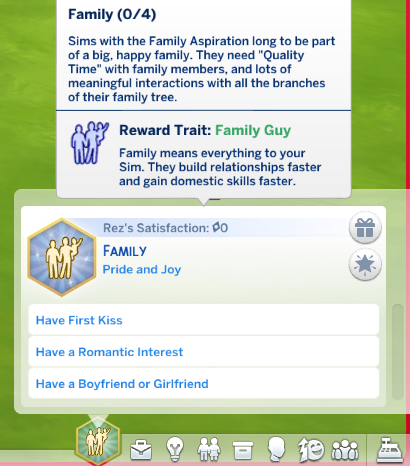 With this trait, your Sim will get boosts in the following skills: Cooking, Gourmet Cooking, Baking, Gardening, Handiness, Fishing, and also gets smaller boosts in Mixology, Photography, and Charisma. The trait also triggers 2 buffs. The Long and Happy Life Buff occasionally appears and will give a boost in all the same skills as the trait. It only appears for 1 in-game hour and is a Happy buff. The next buff is Ah, Kids! which is a Playful buff, though there are no boosts from it.